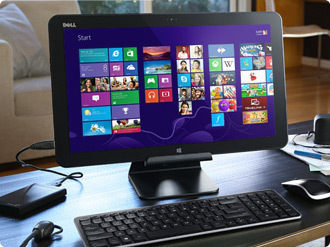 A PC that’s made for movement with all the authority of a desktop and the convenience of a tablet. It is the world’s thinnest and lightest All-In-One and starts at just 4.85 lbs for maximum portability; just pick it up and go! Large 18.4-inch Full HD capacitive touch display opens doors to new ways of working and collaborating. You can unplug and take it with you to create a permanent set-up anywhere with convenient flip-out feet and excellent battery life. A Full HD 18.4” touch display is ideal for navigating and sharing photos, movies and games. And it’s light enough to hold in your lap like a tablet. The latest Intel® Core™ ULT processors and solid-state drive options help ensure strong performance and quick start-up time. The XPS 18 boasts a number of competitive and industry firsts that set a new standard for AIOs. Coming in at just 4.85lbs, the XPS 18 is less than half the weight of other currently available portable AIOs and has nearly double the battery life offering up to five hours of run time between charges. The 18.4-inch Full HD touchscreen is over three times the screen size of the Apple iPad (nearly twice the diagonal) and lends itself to new ways of sharing a computer and collaborating on a single device. It is light enough to hand back and forth, but the screen is large and vibrant enough for multiple people to watch videos, share content or enjoy dual-player games on the same screen from a variety of angles. The XPS 18 is based on third-generation Intel Core processors and Windows 8 operating system for no-compromise performance whether docked or on the go.